Haiti is located on the island of Hispaniola, between the Caribbean Sea and the Atlantic Ocean. It is bordered by Dominican Republic to the east. 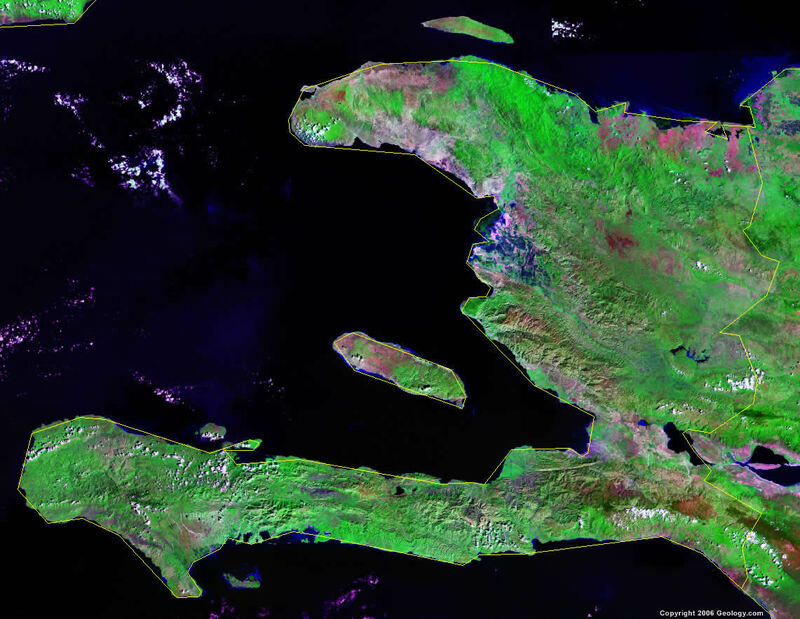 Google Earth is a free program from Google that allows you to explore satellite images showing the cities and landscapes of Haiti and all of the Caribbean in fantastic detail. It works on your desktop computer, tablet, or mobile phone. The images in many areas are detailed enough that you can see houses, vehicles and even people on a city street. Google Earth is free and easy-to-use. Haiti is one of nearly 200 countries illustrated on our Blue Ocean Laminated Map of the World. This map shows a combination of political and physical features. It includes country boundaries, major cities, major mountains in shaded relief, ocean depth in blue color gradient, along with many other features. This is a great map for students, schools, offices and anywhere that a nice map of the world is needed for education, display or decor. 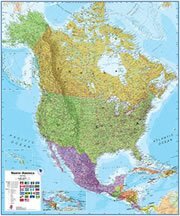 If you are interested in Haiti and the geography of North America, our large laminated map of North America might be just what you need. It is a large political map of North America that also shows many of the continent's physical features in color or shaded relief. Major lakes, rivers, cities, roads, country boundaries, coastlines and surrounding islands are all shown on the map. Abricots, Anse d'Hainault, Anse-a-Galets, Anse-Rouge, Aquin, Baie de Henne, Bainet, Belle-Anse, Bombardopolis, Cap-Haitien, Cotes-de-Fer, Croix de Bouquets, Dame-Marie, Ennery, Fort-Liberte, Gonaives, Grand Riviere du Nord, Hinche, Jacmel, Jeremie, Kenscoff, La Cayenne, Lafond, Lascahobas, Le Borgne, Leogane, Les Anglais, Les Cayes, Limbe, Manneville, Marigot, Miragoane, Mirebalais, Mole Saint-Nicolas, Montrouis, Petionville, Petite Goave, Plaisance, Port-au-Prince, Port-de-Paix, Port-Salut, Prestel, Saint-Marc, Saint-Raphael, St.-Louis du Nord, St.-Marc, Trouin and Verrettes. Artibonite River, Atlantic Ocean, Baie de Port-au-Prince, Canal de St.-Marc, Canal du Sud, Caribbean Sea, Golfe de la Gonave, Grande du Nord River, Lac de Peligre, Les Trois River, Manzanillo Bay, Massif de la Hotte and Windward Passage. Haiti has metal resources which include bauxite, copper and gold. Other various resources include calcium carbonate, marble and hydropower. Haiti has periodic droughts, even though the country lies in the middle of the hurricane belt and is subject to severe storms from June to October. Other natural occurrences include earthquakes and occasional flooding. The country of Haiti has extensive deforestation, as much of the remaining forested land is being cleared for agriculture and used as fuel. As a result, there is soil erosion. Another environmental issue for Haiti is the inadequate supplies of potable water.